The week races by, we are either on the hill, or drying out in the cottage. Where we feast on venison from home and cakes from the supermarket. There is no internet so evenings are filled with military history programs on obscure TV channels. Even the comedy was military history. I quite like military history programs but I'd not considered how much better they'd become in the presence of real fans. I once watched a whole 3+ hours of a marathon on TV with a committed sports buff, previously I'd not been able to work out why marathons were even televised, but there I was enthralled. I've gotta tell you, you've never watched Dad's Army until you've watched it with two guys who are playing the 'more obscure than thou' game, each topping the other with ever more arcane facts about the uniforms and weaponry used in the show. The last couple of days we all spend together further up the glen, where we are stalking in twenty minute sessions from the mobile bothy of the Landrover. Drive a bit stalk a bit. Now we're on the really exposed hillside, the snow has mostly melted but the wind is fierce. Even the ghillie is wearing a smock. As the Landy rattles up the glen crunching the pebble and ice road beneath its fatter taller tyres I'm in the front, to my left sitting motionless on the steep wall of the hill is a Hind. SBW: "Look theres a deer there!" The ghillie seems almost pleased that we're going to knock in an easy one early in the day. Mr Grendel: Don't say that we've got to drive back down south with him [adopts whiney tone] Did you see that? The Ghillie said I was the best when I spotted that deer"
The hind is sitting on the hillside staring at us, I poke the rifle out of the window and chamber a round. The Ghillie: "Wind the feckin’ window up then you’ll have a rest." still the deer doesn't move, 'Feckin'' window wound, I give her a round, still she sits and stares at us. The Ghillie: Why’d do that? She's deed. The Hind in question is the easiest retrieve we done all week, right up until I'm standing on top of her I can't work out why she didn't get up and bound off into the gloaming. At first sight I assume her injury is a broken leg from a fall, the bone has been severed by a round. From the black edges of the wound it looks like she's been hobbling about on it for a few days, the intact part of the leg is swelling but not yet gangrenous. While the Ghillie gralloch's it suddenly occurs to me, it's almost exactly nine years and eleven months to the day that I had shot that first deer, which had also had its leg shot off. 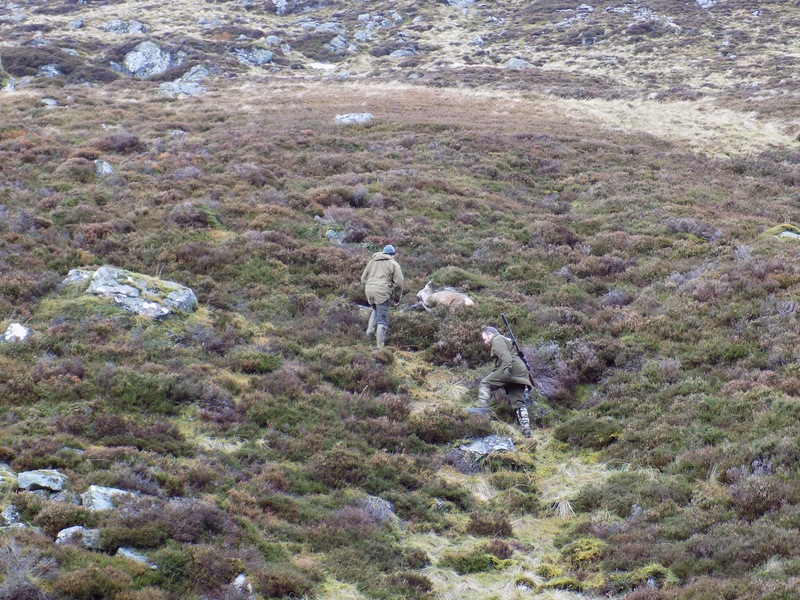 During one of our short stalks from the Landy, which usually involve the Ghillie getting into position, with me trying to join him in time to take a shot only to watch the deer bound away. We find ourselves hiding behind a rather improbable wall. Its not three feet high and runs all the way up and over a windswept hill, and down the other side for no discernible reason. I ask the ghillie why anyone would build a wall there? The Ghillie: "Sheep like ‘em", he looks into the middle distance for a while and adds, "wall bulldin’ and fecking, there’s not a lot else to do"
The Bambi Basher has brought a Ruger No.1 with him, chambered in 25-06. The quarter aught six is a cracking round, popular with highland professionals and Fox shooters down south for it's flat trajectory and reputation as being a lightweight that can still stabilise the 110-115gr pills which the .243's struggle with. If you don't like falling block actions you can start your own blog. The Bambi Basher realises the Falling Block action loads better working with gravity, than against it. The Bambi Basher and Mr Grendel have both gone out of their way to make sure my first Highland Stalking was a success, pushing me to the front. I suspect that they also enjoyed sitting it the warm watching the Ghillie beast me along through the binoculars. As the last day was drawing to a close the Ghillie had one more stalk in mind. Having dismissed my shooting and the Bambi basher's rifles Mr Grendel is in his sights. Ghillie: Mr Grendel do you think that little rifle of your can get me a Hare for my soup? We are all looking out of the Landy's windows with our binoculars, no one wants to be the first to ask what we're supposed to be able to see. Ghillie: You see those little rabbits I painted white for you? As we are now on the highest bit of the estate the wind, which lower down is like invisible tin-snips on your ears, is really fierce. Mr Grendel's first misses, but his second vaporises the Hare's skull at a measured 187m! Ever the Highland Professional the Ghillie made sure everyone goes home with a fitness-appropriate stalk under his belt, and at least one withering remark stinging his ears. SBW:I saw lots of Grouse, how do you raise them? Ghillie: For a guy who loves his shooting, Bambi Basher always brings such rubbish rifles. SBW: Do you mind if I use these gloves? The Ghillie: I don't care as long as you hit the fecker. Ghillie: I think big Bambi maybe fitter than little Bambi. SBW: Where do you stand on the Blaser debate? The Ghillie: [dryness on setting one] You can tell a lot about a craftsman by the quality of this tools. SBW: What do you shoot yourself? It was a fantastic week, which would never have happened without The Bambi Basher's endless enthusiasm and generosity. Many thanks to my new friend Mr Grendel, hopefully we'll all do it again someday. For the gear hounds and kit-tarts I'll do a round up of the gear we used, and the gear we should have used, in a future post.